Active or passive? Many say the debate is dead, but our Investor Insights* research shows you’re still divided over which works best. 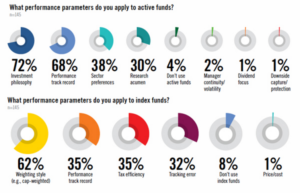 Just over half (54%) say index funds have been at least somewhat more prominent in your practice over the last three years, with the remainder saying they’ve become at least less prominent. Smart beta doesn’t fare much better, with almost half (45%) saying you’ve used such funds more, and the rest using them less. Regardless, you’ll put the screws to fund managers: a manager can only stray 26% from her mandate until you’ll fire her, and 32% say managers should never stray from their mandates. Read on for more. *Confidence level: 95%, with +/­ 8% sampling error. Investor Insights is an editorial research initiative by Advisor Group in which we ask our audience questions about both top­of­mind and evolving trend issues that impact their businesses.